It has been a while since I posted. Our family has moved from Seattle to Irvine this summer and we were preoccupied with purging, organizing, packing and unpacking. I am back now with projects covering a variety of craft media for the upcoming High Holidays. 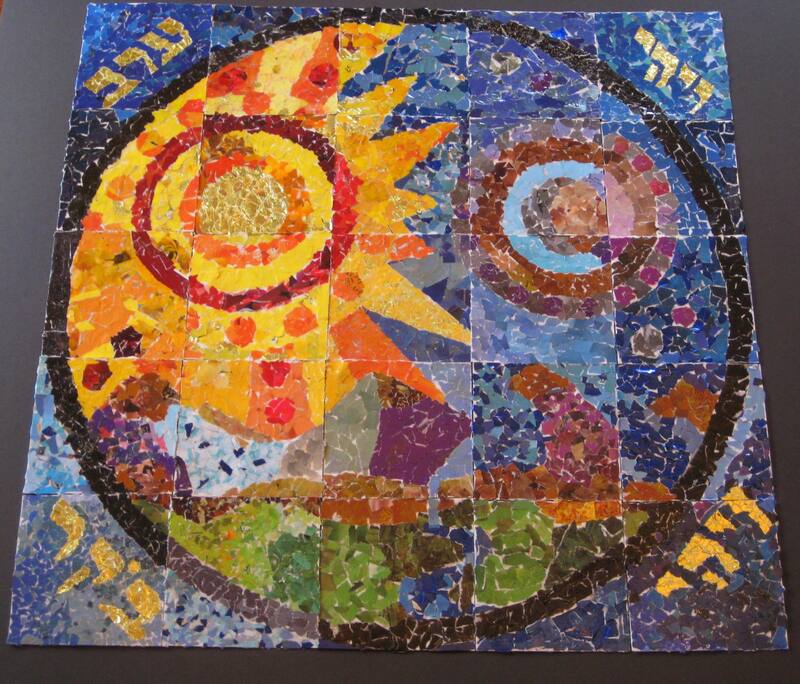 For Rosh HaShana, I created a mosaic from torn newspaper scraps. This technique was first introduce by our beloved art teacher in Seattle and the students became somewhat addicted to it. 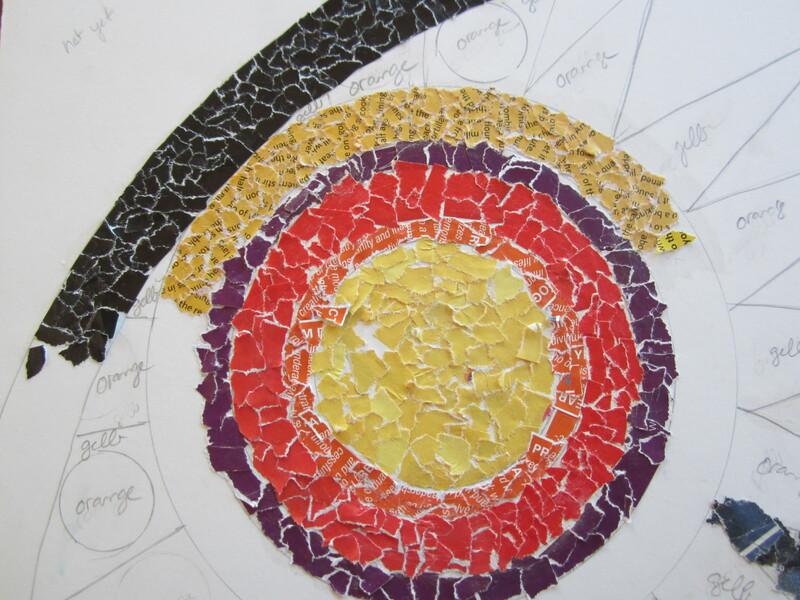 Paper mosaics is so easy and fun that all members of the family can participate. It is not an exact science, kids as young as pre-schoolers can tear off paper and glue it onto the board. 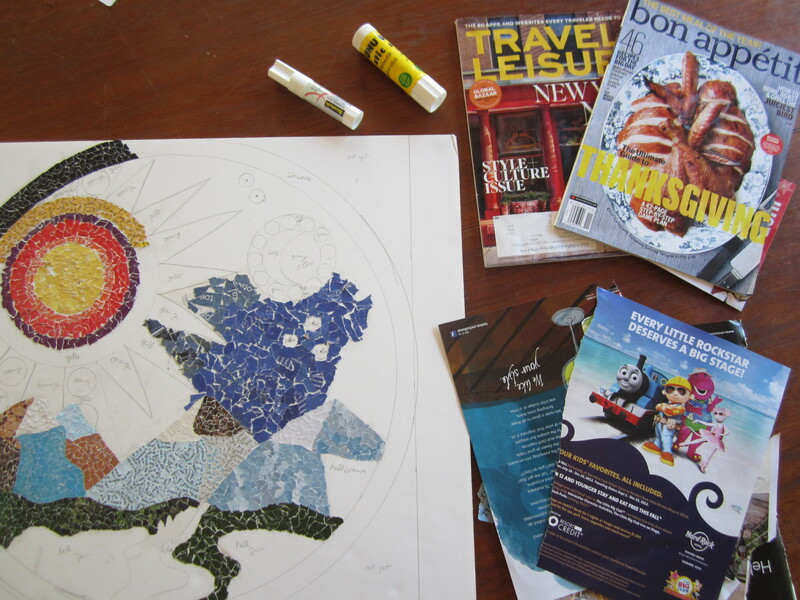 It feels like sitting around the table and doing puzzles together – a creative and meditative process. 2. Find a design that you like. Any image works. I have adapted a design from Ehrman tapestries that resonated with me. (http://www.ehrmantapestry.com/departments/creation-series.aspx) You can enlarge the image by copying it with a copy machine. Then cut out the design, lay it out onto the posterboard and trace it. Alternately, it works quiet well to free draw. For the large circles in my design, I used different sizes of plates, bowls and mugs to trace onto the board. 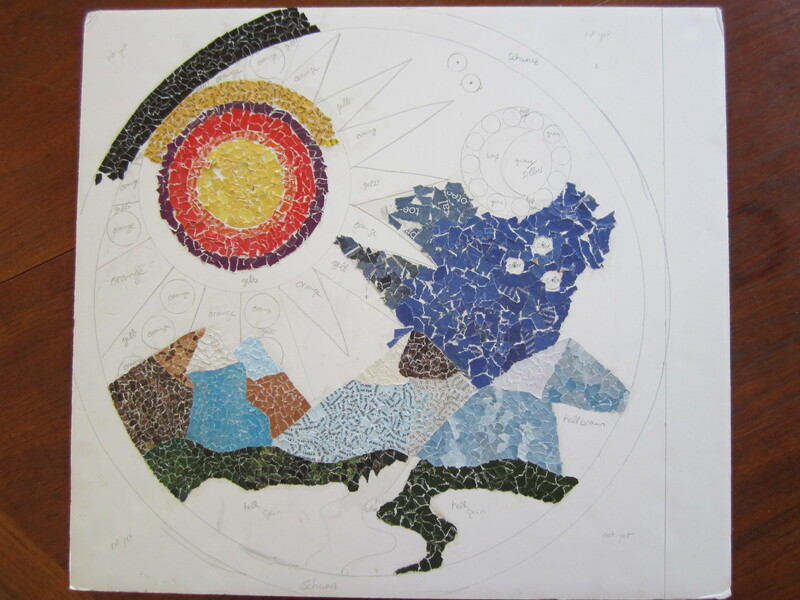 Just remember, the simpler the design, the easier it will be to complete your mosaic. 3. Once you have your design laid out, you label each piece with a color. 4. 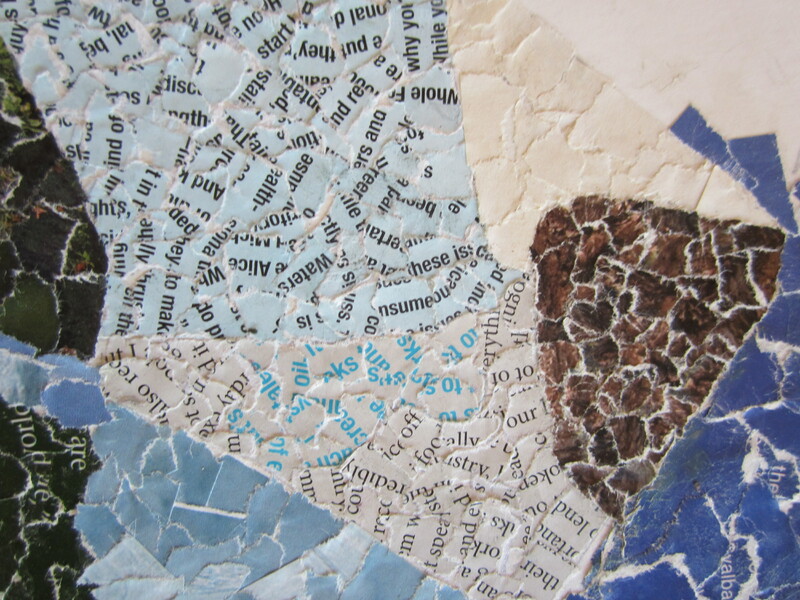 Now flip through the pages of your old magazines and look for the colors in your mosaic. 5. 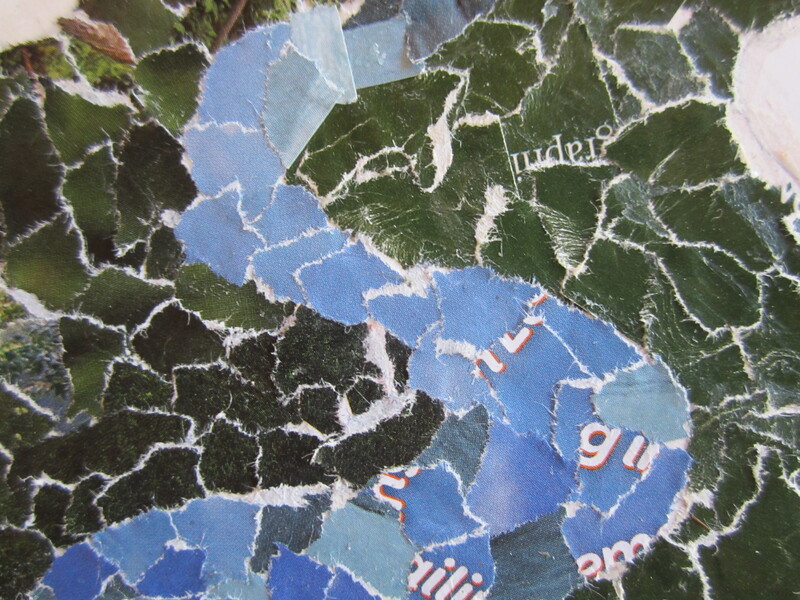 Tear small to medium sized pieces off your magazine and glue it onto the posterboard. It works best to first put glue onto the board and then stick the paper onto the glue. It is fun to play with different texture and even written word in the magazines. This way the picture has an almost 3D effect. 6. Once the entire board is covered, apply Mod Podge over the mosaic. You can do more than one coat for a glossier look. 7. Display to celebrate Rosh HaShana! That mosaic is beautiful! What a great way to celebrate the New Year!